Very strong winds were forecast for today and it was sounding like we could be in for a very unpleasant day weather wise. I got to the pub and there were a few other anglers there enjoying a hearty breakfast to set them up for the day battling the elements and hopefully catching a few fish. Stu Alford came straight over and paid me his pound from last week, cheers mate. A quick look at the section boards revealed Rob had put some cracking pegs in and every one of them was capable of winning, although the pegs at Redbridge would be pretty exposed today. My drawing arm hasn’t been working very well in recent weeks and Tim Ford commented on last weeks post and said to go in first as all the good pegs are still in there, he’s right of course, the winning peg is still there but by my thinking, all the bad ones are still in there too! Anyway we didn’t need to worry about that today as I’d be happy with any of them, Rob announced the draw and asked if I wanted him to draw for me and I said go on then. He pulled one out and handed it to me, I opened my fingers slowly hoping it would say 120 but I wasn’t too upset when I saw I was on peg 129. 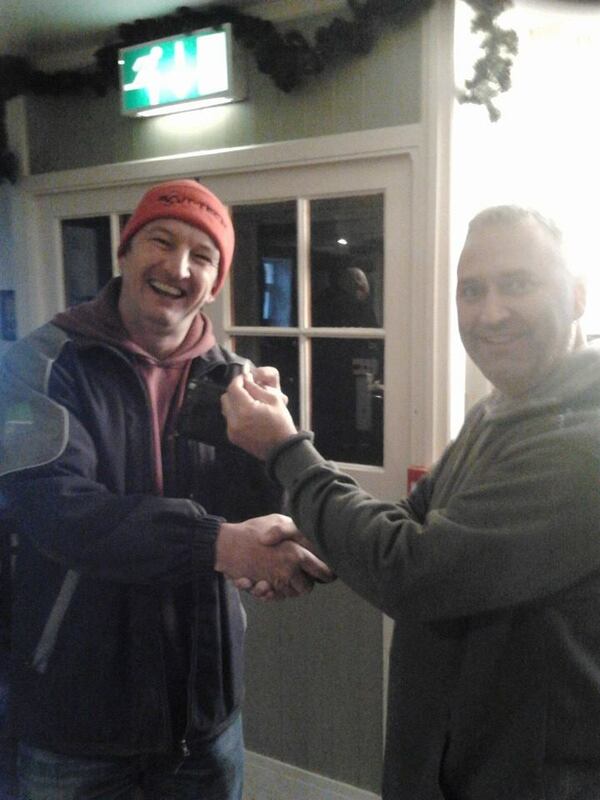 Stu drew Barney’s Bend (126) and wanted to win his pound back and Hurf on 120 and Steve P on H2 at Hambridge were both keen to have a side bet as well. After checking I had enough change to pay everybody, it was time to head off to the river. Peg 129 is across a field and through a couple of gates so it took several trips to get all my kit to the peg and I was rushing around a bit to get ready in time. I plumbed up and my rig was nowhere near deep enough so I had to tie some more line on which wasn’t ideal. There was a copse to my right on the opposite bank which I’d hoped would shelter me from the wind a bit but it was howling down the river making it a struggle to hold the pole at 8.5 metres. I had just enough time to pour a coffee before the whistle went, I shipped out and let the rig run through while trying to maintain some kind of control but the wind was already a nightmare, I missed a bite first chuck and the caster was smashed. Next put in, the float sailed away again and this time the strike saw a fair bit blue hydro appear before I netted a nice 6oz roach. It was then a bite a chuck and I was catching a lot of small roach, dace, chublets and gudgeon with the odd better roach among them. After an hour I had 33 fish and thought I must have getting on for 3lb, a great start. The second hour was similar and although I wasn’t getting as many fish, the roach were a better stamp and I had another 24 fish and thought I’d probably added another 3-4lb to the net. The wind was already proving to be a real pain, several big branches snapped off the trees and landed in the swim and I was beginning to think that if my pole got through this unscathed, it would be a miracle. I started to suffer the odd quiet spell during the third hour and thought either a pike was lurking or some chub had moved in and I hoped it was the latter. I had another 21 fish but also had a good roach come off at the net. A bank walker turned up and watched me for a bit before saying he recognised me from the blog, he said he reads it every week and really enjoys it and found the fishery focus I did on the Isle really useful, I didn’t get his name but thanks for that, it’s always nice to get some great feedback. I had a good spell while he was watching and caught quite a few small fish plus a couple of decent roach. 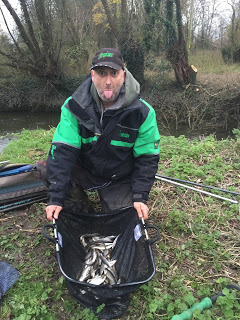 There were obviously a lot of fish in the peg and if I could have got decent presentation I think a big weight was on the cards but I still thought I was on target to do 14-15lb which I felt wouldn’t be far off today. 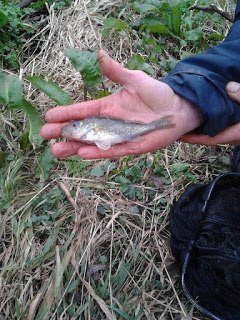 With an hour to go, I was up to 100 fish but still getting quite a few gudgeon, small chublets and roach so I was feeding hemp and casters quite heavily, hoping that more of the bigger roach or even a chub or two might feed. The wind was so bad I was getting really frustrated with the pole getting blown about and also trying to swing small fish in was a nightmare as they kept getting blown out of reach and as a result I suffered with several bouts of wind induced Tourette’s throughout the day. As the light started to fade, I started to catch some better roach and then with only ten minutes left, I’ve struck into what felt like a better fish. I glanced behind me as I shipped the pole back and when I looked back again, there was a fair bit of elastic out and I had to ship the pole back out again. It felt like a lump and I really thought I’d hooked a big chub. It plodded about and slowly but surely I started to gain the upper hand and as the float appeared and the fish started to come to the surface, I have to say my heart was in my mouth. Then all of a sudden the tension was released as a 4oz roach flew out of the water and as I shipped back again, the pike had another go at it’s intended meal – bugger! 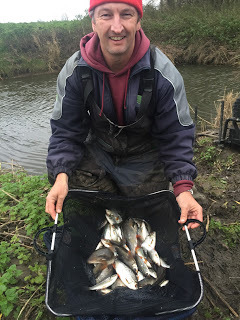 I still had time to catch a couple more decent roach to put me on a total of 122 fish (plus a few minnows) as the five hours drew to a close and I thought I’d hit my target weight of 15lb, maybe a bit more. I started packing up and hadn’t quite finished when Fieldy turned up with the scales, he asked how I’d got on and I said I had around 12-14lb. I asked him and that’s when the pantomime started (well it is that time of year! ), he said he probably had the same as the last match (oh no he didn’t!) 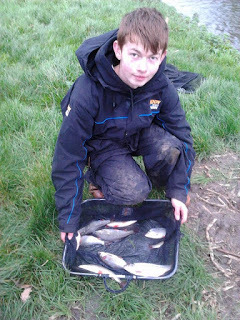 where he had 10lb 12oz and that he hadn’t used his landing net all day (so I knew he’d done well). I pulled my net out and Dame Fieldy said he had nowhere near that (oh yes he did! ), I was slightly disappointed when the needle settled on 12lb 3oz and I knew it wouldn’t be enough today. Stu had 5lb and was overjoyed at paying me another pound! We walked up to his peg and as soon as he took his net out, I knew he’d done me as he had some lovely quality roach and weighed 14lb 5oz. Then Stu Alford had a lot of small fish for a level 5lb, so I was a pound better off at least. 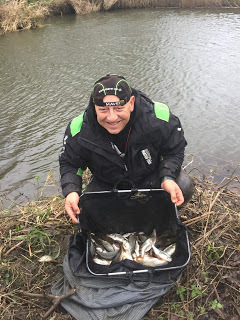 We headed back to meet the others and Karl Aplin had the top weight at Redbridge with 3lb 14oz from peg 110, Rob had one chub for 2lb 12oz from peg 112 and Hurf had 2lb 8oz from the weirpool and although he lost a pound to me he had the consolation of catching the biggest ruffe of the day! 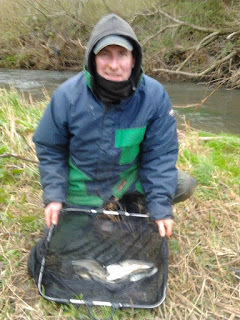 Down at Hambridge, Justin had 8lb 8oz and Steve P had 4lb 1oz so I’d won all three side bets and finished second on the day and picked up £30. *Thanks to Hurf for the photos. 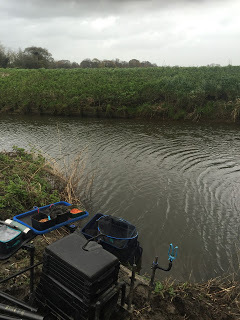 Considering the weather, the river had fished really well again as lots of small fish continue to feature in catches although the mild weather is certainly helping on that front. After four matches and dropping the worst result, Fieldy leads with a perfect three point score followed by me and Rob on six (we’re behind you!, okay enough panto references for now). Next week it’s the Xmas Fayre and I’d be happy to draw the same peg again. Hi Jamie. Wow, a whole new fishing experience compared to the way I fish. Even the gear you use is new to me. Fun to "wade" through all the gadgets you use like electric tape and I'm still not sure what the pole pots are for, but it will dawn on this old Geezer as time goes on. Rivers were a law unto themselves this weekend. The culm was flooded beyond being fish able, as was the Tone. But I drove over several others that looked perfect! 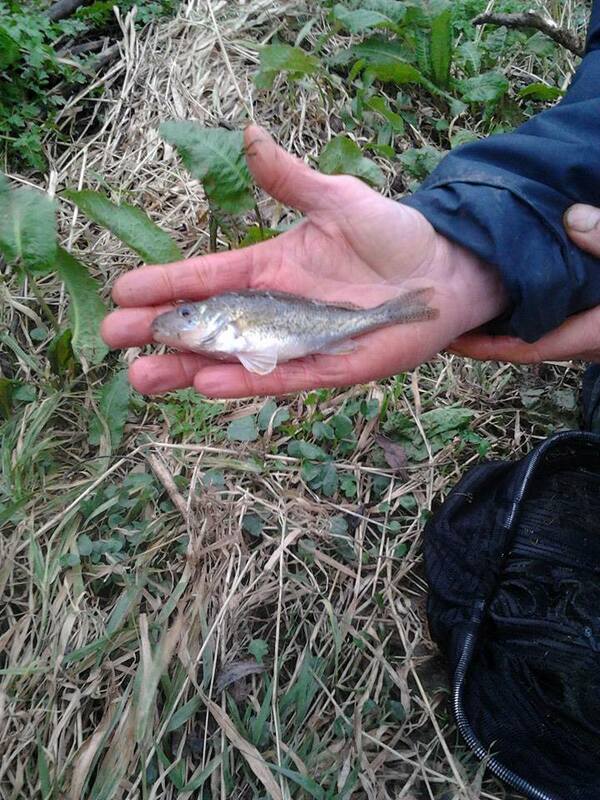 Nice to see some Ruffe showing. Yes, there was hardly any extra water in the Isle at all!